Ruth Renick was born Ruth Griffin on September 23, 1893, in Colorado City, Texas. Some of her films that are generally available on DVD today include "Hawthorne of the USA" (1919) with Wallace Reid, "The Mollycoddle" (1920) with Douglas Fairbanks, "Conrad in Quest of His Youth" (1920) with Thomas Meighan and "Conductor 1492" (1924) with Johnny Hines. 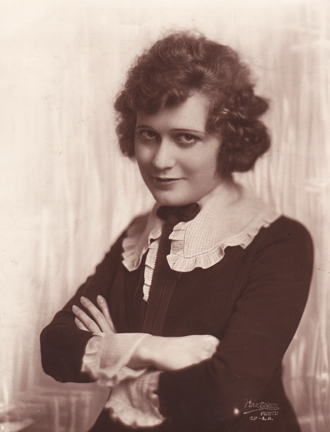 Renick's appearances on the screen were not frequent, at least compared to other stars of the time, although she did have 30 film credits between her first, "Hawthorne of the USA" in 1919 and through 1938 when her last roles were uncredited. For example, after 17 films over a four-year period (1919-1922), she only made three more silent films, one of which was a short. She did continue to work on stage during the 1920's which could account for her infrequent film roles. A 1921 studio directory lists her birthplace as Galveston (instead of Colorado City) and notes that she spent four years on the stage, which included one season in "Shenandoah" and one season in "Secret Service." A 1924 newspaper article states that a man named Wellington Belford was arrested for impersonating an army officer in a honeymoon suite of the Hotel Oakland. Apparently Ruth Renick had spent the last 10 days there with him claiming this was her husband and that a marriage ceremony had taken place, although Belford denied he was married to her. The newspaper article also said an investigation was unable to produce a marriage license. Later articles indicated a fake marriage may have been arranged by Belford, although he continuted to claim no such event ever occurred. Belford jumped his bail and was extradited from Canada with additional charges of embezzlement and a possible murder charge dating from 1919 in London. Renick washed her hands of Belford after these charges were lodged and publicly stated she had no interest in his "plight." A 1930 census lists her as single and living in Los Angeles, occupation: actress. She died on May 7, 1984 in Hollywood, California, USA. She is buried in the Hollywood Forever Cemetery as "Ruth Renick."